Eclipse #10 Review – AiPT! In the future, a catastrophic solar flare has killed off the majority of the world’s population. It’s rendered the sun so hot, that it has become instantly lethal to be outside in the daytime. Eclipse follows some of the survivors of the flare event who have taken up shelter in the remnants of New York City. They live underground, with a select few, using refrigerated “Iceman” suits, venturing out in daytime hours when necessary. Unlike Mad Max or The Walking Dead, society has rebuilt itself into a semblance of the way it was before the flare. However, the government and the powerful Solarity corporation, which controls the solar power to the city, may not have all of the citizens’ best interests at heart. After a year long hiatus at the conclusion of issue #8, the last issue picked up the story right where it left off. David Baxter, the ex-fireman and current Iceman suit expert, had come out of a years long slump where, aside from his work, he had removed himself from society almost completely due to the grief of losing his wife and daughter in the flare. He’s called into action when a murderer who was immune to sunlight appeared, which has woken him up to the possibility that his former friends, and current city leaders, may be more corrupt and self serving that the citizens realize. After following the trail of other sunlight-immune individuals, Baxter is beginning to turn his back on Solarity and the government. 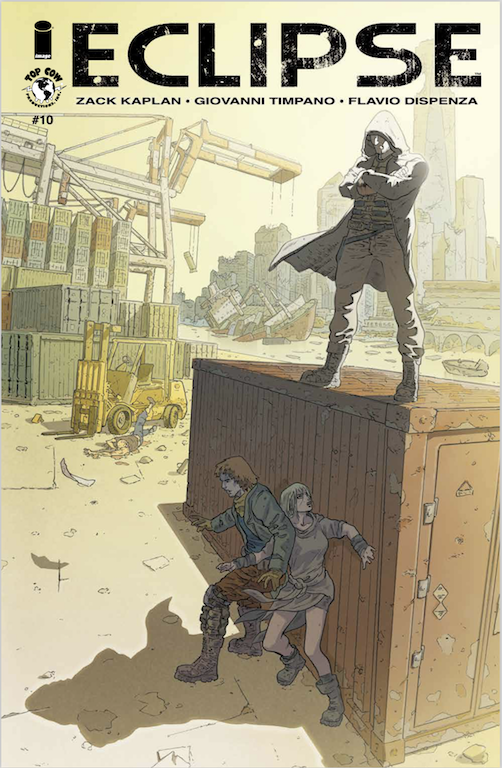 A standoff with some militarized bandits lead by the city’s former mayor and Solarity’s henchmen over the fate of one of the immune has left Baxter and Valerie trapped in the wasteland outside the city, inside a small ruined structure. With the deadly sunlight raising the temperature, the characters are stuck and writer Kaplan uses the opportunity to dig into Baxter and Valerie’s relationship, which has only been hinted at before. I like that Kaplan took the time to reveal any details about the relationship, rather than having them shouting exposition at each other to fill in the backstory the first time they met. He doesn’t show his whole hand this issue, though, so it sets up the opportunity to reach back and play with their history moving forward. It also creates a new motivation for Baxter’s character in this arc, besides him just uncovering Solarity’s misdeeds, which is the area Cielo’s character is inhabiting now. Cielo, who started off in the first arc as merely the privileged daughter of the mayor and one of the killer’s targets, has become a true co-lead in the overall plot. Facing her own mortality made her rethink everything she knew about the current society and she began to question what role her father had played in the events that led to the killer’s creation. After she and Parker are saved by the “Scientist” at the end of last issue, they get down to business, trying to learn from him whether he was behind the project that created the sunlight immune people. He says he can do so again, without the same side effects, but needs certain equipment to do so. Cielo’s not entirely convinced of the Scientist’s motives and finds the leader of the underground, the Conductor, to be less receptive to the idea than she hoped. This leaves her in an interesting and dangerous position at the end of the issue. The writing by Kaplan is good, as usual. He has a talent for the long game, making the issues fit together and tell a coherent over-arcing story, without putting in too much or too little. I find the switching between the two main plots in this issue to work in favor of the pacing, as there isn’t as much action in this one. It works because Kaplan has made both Baxter and Cielo’s plot lines interesting enough separately that you aren’t hurrying through one to get back to the other. I’ve always liked the artwork of Giovanni Timpano in Eclipse, and the consistency of having the same artist for so many issues has lended the comic a unique style that pops me right back into the world as soon as I start reading. Also, Flavio Dispenza, the colorist for the majority of the series, does his job well. There’s always a harsh brightness to the outside, daytime settings and a cooler palette when the action is underground, but that doesn’t give enough credit to how well his work sets the tone of the series and fits with Timpano’s art. Interestingly, there’s a note in the back of the book from Kaplan about how this issue marks a change in the way the panels are laid out. He’s now giving broader scripts to Timpano, who then decides on the order of the panels and what to include in each layout. This caught my eye, because I had a problem near the middle of the book, in the conversation between the Scientist and Cielo, where the action began to flow downwards in a column, then jumped to the next which flowed down and so on. The rest of the book was more traditionally laid out, left to right. The dialogue is usually a hint as to which way to follow action when panels aren’t the same size or lined up perfectly, but I had to reread this one a couple of times in order to make sure I was going the right way. It was a small hiccup for me and maybe no one else will have that same experience. The team of Kaplan, Timpano and Dispenza have come back strong with this new arc. They’ve delivered another great issue that moves the plot forward, while filling in some of the blanks from the past. It’s going to be interesting to see how characters like Valerie and the Scientist are used in this arc, with both being set up in this issue as motivators to Baxter and Cielo’s respective plots. If you haven’t read Eclipse yet, go back to the beginning and catch up. It’s a great story that doesn’t seem close to running out of ideas or steam, with the perfect team behind it, at the moment. It's a great story that doesn't seem close to running out of ideas or steam, with the perfect team behind it, at the moment. With two character plot lines, the pacing doesn't leave much room for dead spots and filler. Cielo has been promoted from sidekick, damsel in distress to character as interesting and important as Baxter. The art and colors do a wonderful job conveying the heat and coolness of the world of Eclipse. A page where the panel order changed had me rereading to make sure I was following the story correctly. Not as much action as other issues.